We anticipate moving house at some point over the next year, so first impressions count. 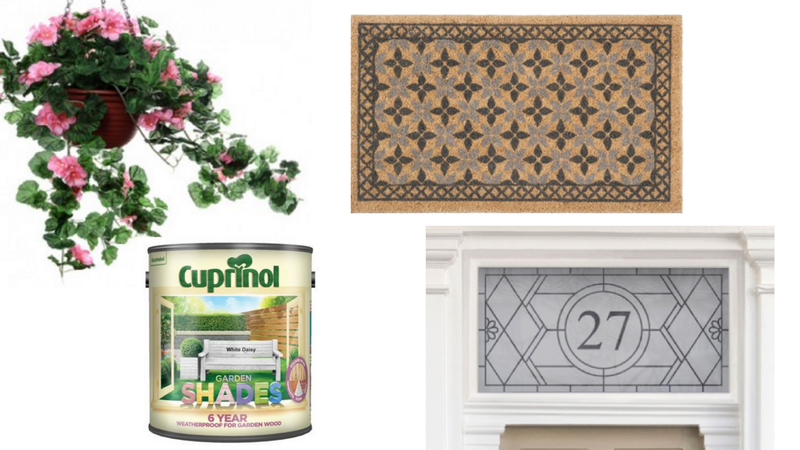 I've compiled just a few ideas which could help smarten up the front of your house, although they are leaning more towards suiting a Victorian terrace house. First up, add some colour to the frontage using flowering baskets or climbing roses. These could be real of course, alternatively if you'd prefer a long-term, no maintenance solution (or have epic hayfever) then artificial baskets could also provide a pop of colour. How about pink geraniums from Country Baskets? You could switch the floral display for each season, or even add some little outdoor fairy lights, particularly around Christmas time. With a Victorian design, this Albufeira coir doormat by Maisons du Monde would be ideal in a storm porch or on the doorstep. It is also fully recyclable too! Our transom window (window above the front door) has been transformed by the application of a made to measure Purlfrost period window film which displays our house number. It was fairly simple to apply and also comes with a free felt-edged tool to smooth out air bubbles without scratching the film. If you'd like to transform the front of your house in one simple step, Purlfrost is offering a 10% off, multiple use voucher code 'Sophie&Lily' which is valid until Dec 31st. It is also a good idea to tidy up masonry and woodwork on the front of your property, whether it be a new lick of paint on your fences or even on your walls. Cuprinol Garden Shades offer a variety of different colours and can be found in most DIY stores. Given the fair weather lately, it is ideal to get cracking on any outdoor painting. Make the most of the sunshine! Awesome work. Following your guidelines, I will be able to design front of my house in a way that will look awesome and will attract all visitors to praise my work.